Paul J. Rogers – Electronics, Sound Sculpture and Noisy Objects. A distinctive and unusual approach drawing on a referential ethos incorporating vinyl samples and other related objects with live piano, creating a contemporary take on the history of blues and jazz. In ‘Ivy Smith’ for example, a vocal line from a 1920s vaudeville blues record is set to a new piano accompaniment, which is based on the tradition of stride blues exemplified by such pianists as Pete Johnson and Claude Hopkins, but which includes right-hand figures that sometimes border on freedom. A sense of bluesy declamation is retained though, and a sense of connection between eras is suggested without consciously valuing one over the other. The connection between free jazz and early forms of African-American music has long been made, by critics and in the music itself. 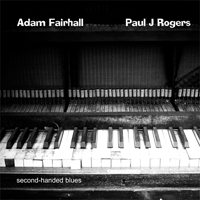 Adam and Paul’s ‘Catfish’ is unusual in that it makes a connection between the modal delta blues of Robert Petway (the sample on the track is from Petway’s Catfish Blues) and the piano language of McCoy Tyner. The combination of the two within a 7/4 time signature creates a music that retains the rhythmic momentum of both sources.